This blog entry was originally posted on October 16, 2003. So I went the other day to Commerce Bank in Hackensack, New Jersey to cash in the 35 lb. (15.876 kg) can of pennies I had collected over the years, to see how much it would add to my trip finances. Commerce has a machine that counts coins for you, targeted for kids (but not exclusive to them) called the “Penny Arcade.” Basically, it’s like the CoinStar machines in the supermarkets, only free-of-charge and more accurate. The machine interface is a touch screen presentation with a cartoon character named “Penny” (of course) and she talks you through the process. Penny told me to pour the contents of my jar, and so, I poured the entire 35 lbs. of pennies into the little orifice, probably only meant for a small piggy bank worth of coins. “Uh oh. Something doesn’t feel too good. Could you ask the teller to come over and fix the machine? Thanks!” Penny shook her head back and forth as she spoke. Mind you, it was lunch time and the only two tellers were swamped with the lunchtime crowd, and all the desk bankers were all out to lunch. So I waited and waited, and I couldn’t just leave and come back because all my pennies were still in the machine. I waited a good thirty minutes patiently — I had nowhere to be really — and figured it was good practice since patience will be a big virtue on The Trip, especially on the upcoming 21-hour bus rides. The guy rebooted the system several times and eventually, the pennies started pouring into the counting mechanism. The counter climbed up and up, passed $10… $20… $30… Penny came on again and said that the penny bag underneath was packed and need to be replaced. For this, she said I had won a prize, and a prize claim coupon spit out like a ticket out of a skeeball machine. A claim ticket was printed and I brought it to the teller to get my paper bills. 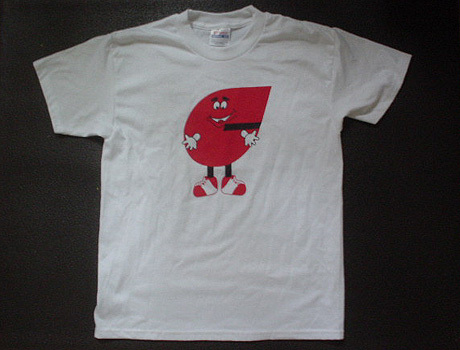 I gave her my prize claim coupon and she told me it’d be a T-shirt with a cartoon version of the Commerce logo on it. I asked for a medium, but she said they only had youth sizes. I took it anyway, as cheesy as it was. Special Thanks to Alan Javate and his lovely baby daughter Penny, Don Wilson and Cheryl Trivino for pledging The Global Trip 2004 Pledge Drive! Send me your addresses and you’ll get postcards from the road! You silly boy. This has been what you’ve been up to??? Tonight’s your big par-tay if I remember. Drink up!! Ant and I will be having a chai on the train from Calcutta to Bhubeneswar. I will check more often now that the REAL stuff is going to be posted. Yes yes, none of this penny BS. The real stuff is coming, don’t fret PC! methinks its a conspiracy. i heard MTL actually collected 35lbs of pennies and dropped it in the Penny Arcade. If you look in his closet, he has his own “Penny” character youth-size t-shirt. Why the implementation of the Price is Right-style assessment of success? At 57.75, my guess was 16 cents closer than mtl’s guess of 55.35 . This, of course, leads me to a much more important question: Why do I care? Well, Wed. is my last day at work. Quit my job to be a freelance writer/photographer. Hopefully now I can travel! I would love to see the world. Quitting my job is at least one step closer.